When the highest hand you can make is an Ace with no pair. A full house with aces and any pair. A player still involved in the hand. A flush containing either clubs or spades. When a player bets all of his or her remaining chips. In online poker, you may be deemed "All-in" when you are disconnected (even if you have chips remaining). A flush containing wither hearts or diamonds. Proposing to another player and agreement, private and outside the rules, that the pot be split evenly regardless of which player wins it, or that players refrain from raising against each other. Money placed in the pot before the hand is dealt. A directive to all the players to put their ante in the pot. Someone behind the scenes who supplies a Poker player with his bankroll. To re-raise another players raise. When a strong hand is beaten by a lucky hand; a long shot win. An observer of a Poker game who is broke and does not play. A check or small bet designed to induce opponents to stay, bet and/or raise the pot. The box or container of the Poker chips representing the money in the game. Current total gambling funds available. Not to be confused with a player's stake in a particular game. Short for a Full Barn which is slang for a Full House. To possess a hand that can beat any exposed card or cards that are exposed in any player's up cards around the table. A complaint or to complain. You're behind if you don't have the best hand before the last cards have been dealt. An inside straight draw. Same as a Gut shot. The act of placing a wager in turn into the pot on any betting round or the chips put in the pot. To be the 1st player to put chips into the pot. The best possible low hand: A-2-3-4-5. Also referred to as a Wheel. A big underdog to win the pot. A hand such as a full house, four of a kind or better. Poker player's term for $500. A game which utilizes a blind. Compulsory opening of the pot by a blind bet as in any form of Stud and Draw Poker, provided it has been agreed to by mutual consent at the start of the game. Money that is hard to get, that one worked hard to earn. To lose back one's profits. A community card in the center of the table, as in holdem or Omaha. Same as an Open End Straight. Four cards to a straight in denomination sequence. A predetermined sum to be paid by the other players to any player holding a royal flush, straight flush or four of a kind. A card cheat who deals from the bottom of the deck while pretending to deal from the top. Pairing the lowest card on the board. A card that appears face up in the deck where all other cards are face down. To draw a card instead of standing pat in Lowball. A player who has a pat nine discards the nine to draw one card to try to improve his hand. A game no longer in action. A card room employee responsible for managing the seating list. After the initial round of cards is dealt, the first card off the deck in each round that is placed under a chip in the pot, for security purposes. To do so is to burn the card; the card itself is called the burn card. The amount of money it costs after paying the entry fee to participate in a poker tournament and receive chips. Chip amounts vary for each tournament and the buy-ins are added to the tournament prize pool. To make a bet without putting money into the pot. To pay later. One who calls the bet. Equaling a final bet in order to look at the active players' hands at the showdown. Best hand wins the pot. An passive player that frequently just checks or calls most bets. Describes the situation in limit poker in which the maximum number of raises on the betting round has been reached. A person who expertly manipulates cards for the purposes of cheating. Two or more Poker players working as a team to cheat the other players. 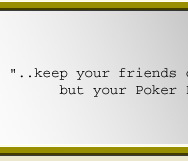 Said of a card player who has natural card-playing ability. A slang expression for a professional cheater at cards. The final hand values are determined by the face up cards and not what the hand holder declares. Ability to remember most of the played up cards in Stud Poker or variants. To leave the game and convert one's chips to cash, either with the dealer or at the cage. Slang to get a card that makes your hand stronger/winning hand. Changing your style of play. To waive the right to bet until a bet has been made by an opponent, and then to increase the bet by at least an equal amount when it is your turn to act. A round token used in place of cash at a gaming table. As the limits increase in tournaments, lower denomination chips are taken out of circulation. Rather than rounding odd chips up or down for each player, the players are dealt a card for each odd chip. The players with the highest card are each given one of the next higher denomination chip depending on how many remain after the colored up. A sucker or inexpert Poker player. To return the blinds to the players who posted them and move on to the next hand, if nobody calls the blind. Games in which all of the cards are dealt face down. An attempt to mislead opponents about one's hand by means of devious speech or behavior. If a player says his cards have "gone cold," he's having a bad streak. When a player with nothing invested in the pot except an ante, calls a raise and a re-raise as his first bet. A Poker player on a losing streak. To exchange one's chips for chips of higher value, usually to reduce the number of chips one has on the table. The fee charged in a game (taken either from the pot or from each player). A fee charged for each hand held. A request to change the chips from one denomination to another. Playing a worthless hand in the hope of improving it is called "playing on the come." To increase an all in-bet or forced bet to a full bet in limit poker. To bet without looking at your hand. A paste or fluid applied to a fingertip in secret, used to mark cards during play. When there is no chance for a player to win. 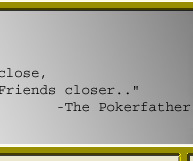 Said of a hand made up of two black pairs, aces and eights. So called because it is supposed to have been the Poker hand held by Wild Bill Hickok in Deadwood, Dakota territory, when he was shot to death in a saloon by Jack McCall on August 2, 1876. Money put into the pot by players who have missed their blinds and now want to post behind the button... their small blind post is "dead money". The discard pile, hands and cards folded and thrown in by the players or discarded prior to the draw. To give each player cards or put cards on the board. As used in these rules, each deal refers to the entire process from the shuffling and dealing of cards until the pot is awarded to the winner. A houseman or player who distributes the cards to the player. Another term for Kansas City Lowball, a two to seven without a flush, being the best hand. In a draw game, to throw cards out of your hand to make room for replacements, or the card(s) thrown away; the muck. A player's first up card in stud games. A two-way inside straight. ie:, 3-5-6-7-9. Also called a Double Gut shot. When the second player re-raises a raise. Cards that are dealt face down in a stud game. When a player has gone all in. Cards dealt from the stock after the first betting interval in Draw Poker. To catch a card that improves your situation from a losing hand to a winning hand. A bent corner put on a card to identify it or locate it. Position on a round of betting where the player must act before most of the other players at the table. (It's considered the two positions located to the left of the Blinds). Anyone who gambles big at Poker and spends winnings freely. The last bet prior to a showdown. This is when all Players have contributed the same amount of credits to the pot. A bet or proposition that gives each player an equal chance to win. A face-up card, or up card, in Stud and in community cards resting in the center of the table. An exposed pair, as opposed to a split pair or a hidden pair. To expose the face value of a card. A crooked cut that leaves the deck or part of the deck in its original position. One in which the pot is opened with less than the required rank hand and is therefore dead. A crooked shuffle that appears to be an honest shuffle, but in fact does not mix the cards at all. Where everyone at the table is still involved in the pot. To increase the money or chips in the pot. To put money or chips into the pot. represents the third round of betting. To draw a card that makes a five-card hand (straight, flush, full house, straight flush). To fill a Full House. Slang for a player who plays to fifth street with a poor hand in hopes of making the best hand by luck. In limit poker, any betting structure in which the amount of the bet on each particular round is pre-set. A card that is partially exposed. A casino employee who seats players and makes decisions. In holdem or Omaha, the three community cards that are turned simultaneously after the first round of bettings are complete. A family of poker games played with five community cards. The first three cards, turned face up simultaneously, are called the flop. Popular flop games include Texas Hold’em and Omaha. (i) A situation in which two players have the same hand, but one of the players has a chance to better his hand. (ii) A chance to win something at no risk or cost in online poker. A buy-in of at least the minimum requirement of chips needed for a particular game. The first player to act on his hand. Mixing up the cards by drawing two cards at the same time from the top and bottom of the deck in order to premix a fresh deck prior to a shuffle. Any secret device or method that accomplishes or aids in cheating. To back or try to shield a crooked move in Poker. The four queens in a deck of cards. A good bet or a good hand. To put money in one's pocket during a Poker session. A low-limit Poker game that requires a good many players and good action in order for the operators to make a profit. A draw to an inside Straight, as in 2-3-4-6. A Poker crook or cheat. A fixed betting limit that permits a player to bet, raise or re-raise no more than an amount equal to half the size of the pot. (i) All a player's personal cards. (ii) The five cards determining the poker ranking. (iii) A single poker deal. To bet against a Poker situation already bet in favor of, in order to be sure of a possible profit, or to cut down or limit a possible loss. A cheap poker player or anyone who is not good. One that improves one's hand. Forms of poker in which the pot is split between the best hand and best lowball hand. A side bet usually made in Draw Poker in which the hand containing the highest spade cards wins. To pull the card one is seeking. To hold the best card continuously against a certain player. The establishment running the game. Generic term for how the house profits from hosting the game. To draw cards that better one's hand. A hand that is sure to take the pot, or a hand that is played as though it is a certain winner. 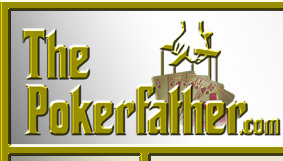 A form of poker in which the card room offers a jackpot for particularly bad beats. Typically you must have aces full or better. Draw poker in which a pair of jacks is the minimum hand permitted to start the action. A non-playing spectator; a rail bird. A separate high card used to break a tie. An oversize blind, usually twice the size of the big blind and doubling the limit. Sometimes a “half-kill” increasing the blind and limits by fifty percent is used. A kill can be either voluntary or mandatory. The most common requirements of a mandatory kill are for winning two pots in a row at lowball and other games, or for scooping a pot in high-low split. Positions on a round of betting where the player must act after most of the other players have acted (usually considered to be the two positions next to the button). A face card. (Because you can see a line when the card is face down and the lower right corner is lifted). The ordered roster of players waiting for a game. A hand that is guaranteed to win at least part of the pot. The lowest up card at seven-card stud, which is required to bet. A player who bets, raises and re-raises without much regard to the quality of his hand. Cards that have been (illegally) altered so that their value can be read from the back. A cheat who can manipulate the cards to deal himself or another player a good hand. Pairing the second highest card on the board. A hand dealt incorrectly that must be re-dealt. A powerful hand that is almost certain to win. Five dollars, usually represented by a red casino check. A version of poker in which a player may bet any amount of chips (up to the number in front of him). The highest possible hand in Poker. A very tight player who plays only the best hands. A situation where the player does not yet have a complete hand. Playing worse (usually, more aggressively) than usual because a player has become emotionally upset. Cards in a hand that qualify a player to open the betting. A category of games characterized by a part of each player's hand being exposed. When your full house is beaten by another full house. In Hold'em, a pair in the hole that is larger than any community card on the board. A face card (King, Queen, Jack). (i) Decline to bet. In a pass-and-out game, this differs from a check, because a player who passes must fold. (ii) Decline to call a wager, at which point you must discard your hand and have no further interest in the pot. Checking and calling hands rather betting and raising hands. Calling a bet with little expectation of winning, unless the opponent is bluffing. Using all five community cards for your hand in hold’em. The betting structure of a game in which a player's maximum bet is the size of the pot. The calculated odds the money in the pot represents in relation to how much it will cost to play and hand and the players chances of winning the hand. A person hired by the card room to work as a shill. A card room employee who joins a game with his own money when the game is shorthanded, or to get a game started; similar to a shill. When a new dealer replaces an existing dealer at a particular table. The situation in which two or more players make an agreement to return bets to each other when one of them wins a pot in which the other or others play. Also called saving bets. A container in which chips are stored while being transported. A card that helps no ones hand. An amount of money taken out of every pot by the dealer - this is the card room’s income. The numerical value of a card (as opposed to its suit). The option to buy additional chips. Rules vary regarding the amount of chips a player may have in their possession in order to buy more. Implying, by one's betting style, that one has a particular hand. The final (seventh) card dealt in a poker hand. In Hold'em and Omaha, it is also known as 5th street. In Stud games, it is also known as 7th street. A very tight, conservative player who only plays extremely good hands. In public card rooms, an hourly fee for playing poker. Disguising the value of a strong hand by under betting, to trick an opponent. Games in which there are no community cards, the player plays only the cards in his/her hand. (i) The amount of money you have on the table. This is the maximum amount that you can lose or that anyone can win from you on any one hand. (ii) The requirement that players can wager only the money in front of them at the start of a hand, and can only buy more chips between hands. To bet the amount of an opponent's entire stack, forcing him to go 'all in' if he calls the bet. A tip given to the dealer. Quite often, tokes represent the great majority of a dealer's income. A poker competition, normally with an entry fee and prizes. When one set of Trips are beaten by another set of Trips. Slang for triplets. Three of a kind. A person or hand who is not mathematically favoured to win a pot. A card that is dealt to the player face up, so that all players may see it. Up cards are used in Stud games. (i) To bet or raise. (ii) The chips used for betting or raising. A pair in the hole. In 5-card stud, a door card that pairs the hole card.